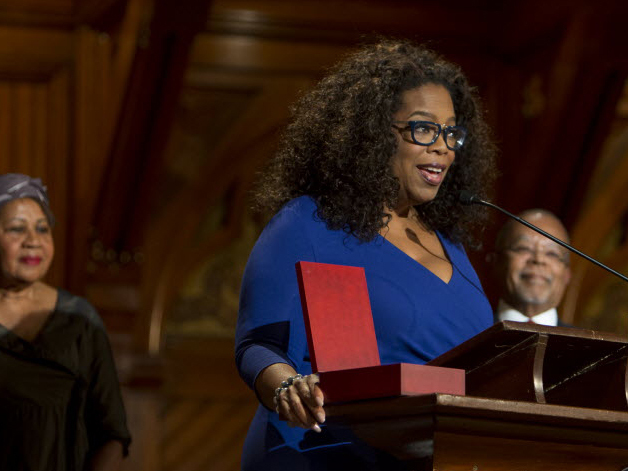 Oprah Winfrey accepts the W.E.B Du Bois Medal for the late writer and activist Maya Angelou. 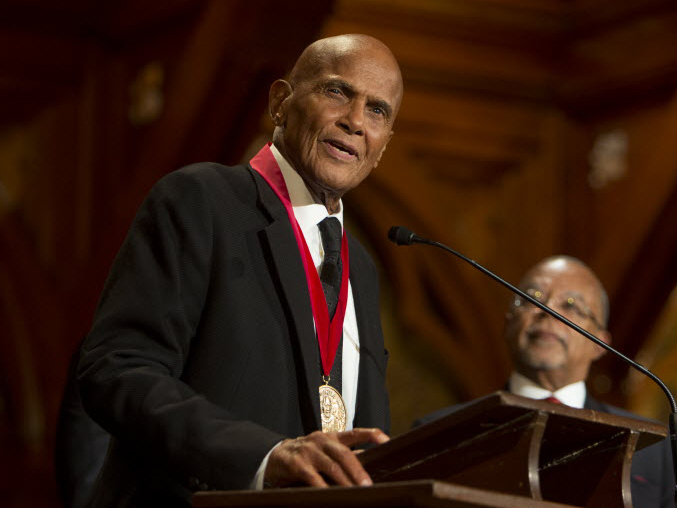 Emmy, Grammy, and Tony Award winner Harry Belafonte accepts his W.E.B Du Bois Medal. Accepting the W.E.B Du Bois Medal for the late writer and activist Maya Angelou in Sanders Theatre Tuesday evening, Oprah Winfrey, LL.D. ’13, recalled what she said were some of the greatest times and memories of her life: sitting at Angelou’s table, eating biscuits. Joining Winfrey onstage to accept their own medals were architect David Adjaye, artist and activist Harry Belafonte, Congressman John L. Lewis, LL.D. '12, of Georgia, Oscar-winning filmmaker Steve McQueen, television producer Shonda Rhimes, and Miramax founder Harvey Weinstein. First presented in 2000, the Du Bois Medal is Harvard’s highest honor in the field of African and African-American studies; it recognizes outstanding contributions to African-American culture. This year, its recipients reflected a focus on the arts, apart from Lewis, who was unable to receive his medal last year because of the government shut-down. After the Kuumba Singers performed a moving opening song, “Lift Every Voice and Sing,” Fletcher University Professor Henry Louis Gates Jr., director of the W.E.B. Du Bois Institute for African and African American studies, spoke about the importance of African-American art throughout history as a force for political equality. The ceremony also served as a formal introduction of the Ethelbert Cooper Gallery of African and African American Art at the Hutchins Center for African and African American Research, a crucial new addition to both Harvard Square and the Harvard community, Gates said. Designed by honorand Adjaye and slated to open this fall, the gallery will feature contemporary African and African-American art in its exhibitions and installations. Geyser University Professor William Julius Wilson introduced Steve McQueen, whose film 12 Years a Slave won the 2014 Academy Award for best picture—honoring “a body of work that allows us to look at and change our perspective,” Wilson said. Graduate School of Design dean Mohsen Mostafavi introduced the next honorand, Adjaye, the Portman Design Critic in Architecture at the school, who has been the “master craftsman” behind major art centers and public buildings across the world. His National Museum for African American History and Culture on the National Mall in Washington, D.C., part of the Smithsonian Institution, is expected to open in 2016. Du Bois professor of the social sciences Lawrence Bobo introduced screenwriter and producer Rhimes, who is known as the “Queen of Thursday night television” for her hit series Grey’s Anatomy and Scandal, and a new program this season, How to Get Away with Murder, starring Academy Award-nominee Viola Davis. And ART artistic director Diane Paulus introduced Weinstein, her partner for the company’s most recent production, Finding Neverland, which is now headed to Broadway.